Looking forward to seeing you all on there!! 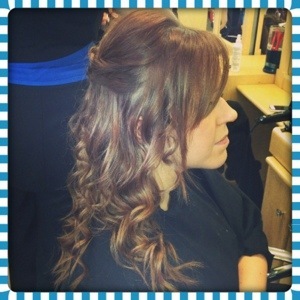 💇💁👋 Oh and here are some pics of me creating a curly style using a curling wand! I love this look, it’s really pretty! I gently back combed the fringe and the top section into a slight quiff then used the curling wand for the bottom section! To finish I applied hairspray to the style, spraying more on the curly section at the bottom to hold in the curls! See you all on Instagram!